Bakrid or Valliya Perunaal also known as Id-ul-Zuha in Arabic, is a festival of Muslims.It is celebrated on the 10th day of the last month, Zil-Hijja, of lunar calendar of the Muslims.Bakrid is also known as the Festival of Sacrifice celebrated in remembrance of the sacrifices made by Prophet Ibrahim.This festival coincides with the Haj pilgrimage in Mecca. While the pilgrims are making their sacrifices at Mina, the ceremony is observed simultaneously by Muslims everywhere. According to Islamic belief,to test Prophet Ibrahim’s faith, Allah commanded the Prophet to sacrifice his son. Even though he agreed he could not tolerate to see it and so blind folded his eye. When he removed the cloth he was surprised to see his son alive. Instead a lamb was sacrificed. As a memory of this on Bakrid, people sacrifice a goat. This test was done at Mount Mina in Mecca and during this festival many people gather here now. In kerala on Bakrid day muslims dressed in their best clothes go to the mosques in the morning to offer prayers to Allah. 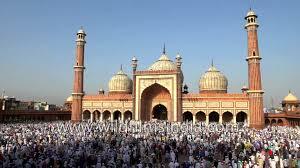 They gather in mosques and Id Gah grounds to participated in Id namaz. This will be followed by sermons by Imam on the importance and relevance of Bakrid. The festivity at home commence after the ceremonial prayer with hearty feasts followed by social visits. Women enjoy this occasion by paying visits to the neighbouring houses. And Children get money to buy things and some people arrange group picnics also.Special meetings are held in the evening also. All celebrations of the Muslim community emphasize on promoting brotherhood and affection to all the people and to show gratitude towards God in that way.